You can read the related posts on the Teaching Your Children & Students About Tragedy, Teaching Your Children & Students About the 2nd Amendment, The Problem With Kids Today Is…, and 12 Ways To Create A Safe and Effective Space For Student Learning. Nearly every aspect of American society has become overtly politicized (for good/for bad?) forcing one to ‘pick their side’. There is one thing though that still seems common to all. Everone recognizes, in the aftermath of watching children be slaughtered en masse at another school shooting, that we are in a state of crisis. The unity though seems to end there as camps disperse with some calling for increased scrutiny and improved legislation while others talk about better security and more firearms. Granted, other pieces of human garbage are denying that these events happened and calling them staged, so I guess I may be wrong about that initial unity. This is an issue that I don’t want to talk about on an education blog, but in the face of prominent and mounting voices calling to arm teachers, I felt it needed to be addressed. So what does a teacher do in the face of this? I think after these tragedies, it’s important, as a parent or teacher, to first console those who are suffering directly or indirectly and have a conversation about their possible anxiety in the face of mounting threats. As I’ve said before, the first job of a teacher is to create an environment that is safe and conducive to learning, and I provided 12 ways to do that. Not one of those included acting as a human shield in a firefight. Should that be something we expect of teachers? The answer, at least from some with the power to change laws, is that, yes, that is their job. Not only that, but some expect them to confront that shooter with their own weapon. On top of the many responsibilities and crowded classes teachers already have, we are now asking them to act as security and law enforcement (which doesn’t even touch how too much is being asked of law enforcement). I have to say that even hearing someone talk about schools as “soft targets” and the need to harden them makes me both nauseous and leaves me wanting to know what broke that person. Who talks about institutions of learning that way outside of a militarized zone? Have we reached that point? I have vacillated over whether to post these ramblings or to keep them solely as my own cathartic diary. I seriously don’t want to be talking about this. I have 50+ EdTech blog posts waiting for me to review and post that I would hope could improve instruction and access. But instead of talking about more technology in student’s hands, I’m spending time discussing fewer bullets in their bodies. And why now? Because it’s supersedes other concerns. In New York City, one student with autism broke out and drowned and suddenly the top priority was door locks and alarms. How much more for the many young bodies laid at the foot of semi-automatic weapons? For so long we had come to expect the cycle of outrage, reports, thoughts, prayers, calls for legislation, shouts about freedom, no actions taken, crickets chirp, rinse, and repeat. Part of the reason I think little has changed to this point is that one side feels the need to couch every argument behind ‘I don’t want to take guns, but… I love the 2nd Amendment, but…’ followed by some usually small and sensible proposal. Meanwhile, the other side says, “You’re like the Nazis who took guns, these were all faked, kids are idiots, video games, not the time, or more guns…from my cold dead hand.” And in that argument, only one side seems energetic enough about their cause. I’m apprehensive about expecting any change in that cycle, but I am hopeful that, as it seems, the energy is shifting. So after stewing in my suppressed rage and hearing the same long rehearsed arguments brought out (statistics, mental health good guys, etc. ), I began to hear the call for arming teachers spoken with renewed vigor even from positions of power. In the face of this mounting rhetoric I am compelled, as an educator, to speak publicly. Maybe no one will read it or maybe I’ll be publicly decried. Regardless, how can I remain silent any longer when the students who have experienced these tragedies firsthand won’t? I’ve seen too many times where students were forced to cower in fear for their lives. I’ve had too many drills where I practice cowering quietly with my own students. I am done cowering from speaking out about an issue that, as a teacher and father, I have a stake in first-hand. So when I say never again, I am not saying that there will never again be a tragedy like this. I am saying that, as weary as this makes me, never again will I stop doing what I can to make sure there that it never again happens and we are never again complacent and complicit in the loss of these children, our greatest hopes for the future. This is actually a little tricky as one of our ‘gun laws’ actually prevent an organization like the CDC from keeping data on guns as well as keeping other federal organizations from keeping computerized records (Dickey Amendment). It would appear then that we have decided information on guns (which could decrease manufacturer profits) is something to fear, but the guns themselves are cool. For that reason organizations like the Gun Violence Archive have taken on the task of tracking that data which leads some to question its reliability. 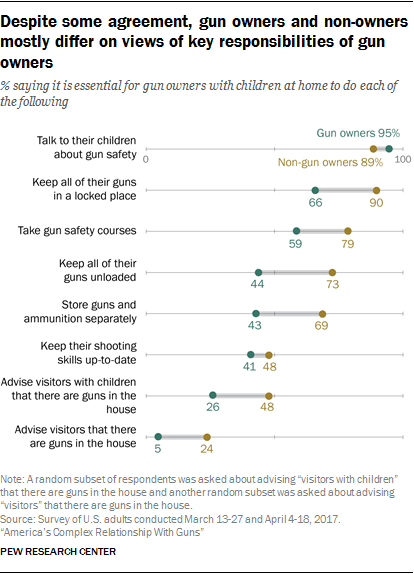 In the face of that there is major disagreement about what gun homes (30-40%) and non-gun homes (57%) feel is the responsibility of a gun owner. One definite thing though is that televised mass shooting events do lead to an increase in gun sales (usually of the type used in the event). The challenge is that there are multiple issues tied together through guns. The first is our uniquely American problem of mass shootings (sometimes with assault rifles, a term not generally used by gun enthusiasts, semi-automatic weapons) along with the prevalence of gun deaths and suicides. In some ways, solutions may overlap, but these may each require distinct solutions. Those who would say one soultion won’t solve each problem are likely correct, but they are generally more inclined to want nothing done. I think the victims would see value though in correcting even one of those problems. So understanding the scope of the issue depends on how we define it. If we’re talking about mass shootings, the FBI clearly defines it as an instance where 4 or more people are shot in proximity and you can peruse those terrible numbers. By that measure there have been 34 mass shootings so far in 2018 which is a small part of the 7,800+ shooting incidents and 2100+ deaths. We tend to think of school shootings as mass casualty events like the one in Parkland, Florida, but if we say that it is any time a gun was discharged on a school campus then we get the disputed number of 18 so far. So what should we count? What does it matter if you don’t trust the sources that would give you the information? The argument it shouldn’t be counted if no one died or that it was only a suicide or accident does little to allay my fears as a parent. But fine, let’s forget 18 and 34. Let’s say a school shooting is a firearm attack (neither accident, suicide, or unexplained shooting) during school hours, so that gives us 7…or does someone need to die, then 5 incidents this year. That’s almost once a week. If death is necessary for a mass shooting then there were at least 18 this year. Are those more acceptable numbers? Are those enough to still feel okay with where we stand? Is that what really matters? I don’t know how to tell you how big a problem gun deaths are in America, because it all depends on how you see it. Is your first instinct to lament it or compare it to automobile deaths? Tell me how frequently does it have to occur to necessitate change? How many bodies are necessary for us to grow tired of parroted conspiracy rhetoric and demand action in some way? Was Las Vegas enough bodies or Sandy Hook enough of a tragedy? Congress found it acceptable to ignore those parents, so how surprising is it that Florida lawmakers chose the same route with Parkland students? If it’s only once a week or once a month that we watch children slaughtered, is that an acceptable amount? How many lives would new legislation have to save to be worth the minor inconvenience of it?That’s a personal question for you to answer. For those who believe any gun control legislation is an infringement, the answer may be unlimited. This is where the debate tends to go. Who or what you blame for these events is directly related to what you already feel about our nation, politics, and the 2nd Amendment. Some mention background checks for guns or banning certain types of firearms and accessories. Others talk about mental illness with genuine concern and others use that complex issue as a shield to avoid confronting other things. Some are quick to get defensive crying out for more guns and more security? They blame the FBI, kids today, video games, a lack of religion, no discipline, unarmed teachers, and all the other ‘horrors of our modern society’. So most of us begin focused on one core thought with little consideration for anything beyond that. I don’t expect anyone to change their mind reading this as information has little impact on cognitive dissonance. I will try to be as objective as my own humanity allows though. This covers those who blame godlessness, no spankings, video games, cell phones, modern millennials, or Generation Z for these issues. I covered that pretty thoroughly in The Problem With Kids Today Is… so I won’t rehash it here. Most of those things have been shown to have no impact on increasing aggressive behavior and video games have actually been shown to decrease negative behavior. So I see posts like the one below that have become so popular when disparaging ‘modern kids’, their parents, and video games and see her not as a ‘bad guy’, but at the very least as someone misinformed. I respect her personal experience, but it is only anecdotal at best. At worst, it’s pushed forth as a means to assuage a personal sense of guilt or to misdirect from other more relevant arguments. I respect her experience as a teacher but on some these topics she address she is flat out wrong. I have worked with some of the most emotionally fraught students in challenging situations. Even with that, I recognize that the want for those from previous generations to cast their struggles on younger generations is solely meant to assuage their ‘bad feelings’. I will say that while there are some issues unique to modern students that create increasing challenges, they are, in many ways, healthier and better off than those who came before them. One thing I didn’t get into though when discussing modern student challenges is a comparison to other countries. We are lagging behind several nations in instruction, but we are not unique in decreasing religiousness, cell phones, or (as I will address below) mental illness. We are a very depressed country that’s for sure. We’re not exactly unique in that regard as China, India, and several other countries also have high levels of depression, anxiety, and substance abuse. Those countries do have high rates of suicide, but unlike us, that often involves bridges instead of guns. Those countries, including Russia, also don’t have mass shootings. The two differences there seems to be the number of guns and the types of them that are allowed for the general public. In India and China, depression and suicide seem to be a uniquely female issue which isn’t surprising in countries with high poverty levels and drastic gender inequality. Russia and the US though have a predominantly male issue. Both countries have guns and high gun murder and suicide rates for men. Russia though generally only allows handguns, bolt-action rifles, and the like, and the number of mass shootings is distinctly lower. As for murder rates, even with guns, the U.S. is lower than many countries per capita, especially those in Central and South America. When compared to similar high-income countries though the U.S. is definitely unique in terms of gun deaths. One clear detail though is that there seems to be a direct link between domestic violence and mass shootings. You may not realize though that the mentally ill are actually less likely to commit a crime or be violent. They are actually more likely to become the victim of a crime. Murder and aggression aren’t innately tied to mental illness even though it seems like the perpetrators ‘are obviously crazy’. As for muder rates, even with guns, the U.S. is lower than many countries per capita, especially those in Central and South America. When compared to similar high-income countries though the U.S. is definately unique in terms of gun deaths. One clear detail though is that there seems to be a direct link between domestic violence and mass shootings. So mental health is a large and complex issue that genuinely does need to be addressed. For those of you genuinely concerned, take action. There are those though who would only use mental health as a distraction though to justify inaction. When laws that add gun restrictions, even if they are flawed, to those receiving mental health benefits get repealed with no alternative offered then the mental health argument seems false. When money is cut for health concerns, the effort seems hollow. There are serious addiction and depression concerns that are incredibly important, but they shouldn’t preclude other action from being taken. This is an issue on which I’m torn as this can be good and bad. Some people seem to distrust what they term ‘mainstream media’. Certainly some tv news sources, regardless of position, are overly hyperbolic in their coverage. I’m inclined to say that the coverage is too intense and immediate and may lead to emboldening future acts of violence. I certainly agree the perpetrator should be far less the focus (his beliefs, background, manifesto, etc.) than the victims. Some people who claim to abhor the coverage though may simply be trying to ignore the disturbing truth. I would say lessen it, but there were 34 mass shootings this year (see above) and you’ve likely only heard of the ones with a high enough death toll. We’ve already reached the point where this violence is so common that it isn’t automatically major news. In the face of all that coverage though you have people (and I refuse to link to them) who deny that events like Parkland and Sandy Hook even happened. Others, including a former congressman, are accusing the students of being hijacked an manipulated. So to be clear, a man tasked with representing America who has been paid by lobbying groups to parrot their talking points accuses first-hand victims of a tragedy of being ‘paid-off and coerced’ for discussing ways to stop future tragedies. If that can be done in the face of the intense coverage, how much more would it be denied if they weren’t covered? This is the area where it gets personal for me and any objectiveness becomes more cloudy. When I first hear that what the schools need to stop shootings is more guns for more people, my jaw drops and I shake my head. While a gun can serve as protection for those capable and trained, a gun in a home increases the homicide, suicide, and accidental death risk of all there. Multiply that by a school full of them. At least those homeowners chose that risk, but a school is made up of public employees, parents, and children who likely were not informed of your choice. Granted there are some communities where teachers have already decided to carry guns. It may surprise you to know how many places allow for it. Some people may have the skill or aptitude for it, but it doesn’t seem in any way viable as a blanket solution to the problem. Though for most of these places it’s restricted to security or college campuses. The prevalence of these tragedies has now created a unique market in united states for mass shooting specific solutions. These include the bulletproof blanket and the barracuda door block. I’m not sure if this would be beneficial in any way, but I don’t fault these companies at all for filling a hole in the market that our legislators and society refuse to address. Then we get to the metal detectors, security, and armed teachers. There may be specific situations where those may be of worth in a specific community. I once had a student bring a knife that he planned to use on a kid who kept sticking up his finger at him. There was no detector, but a cursory check of notebooks led to it being confiscated. Research on metal detectors actually shows they are unlikely to help in school and actually more likely to have a negative impact on students. I understand some may feel comforted by the presence of a gun or armed security, and right now that is in the hands of their community to decide. Of course, adding 6 to 8 guards per school is about 1 million guards. That could cost about $100 billion. There are a number of reasons though that this idea is problematic in the best scenarios and absolutely delusional in others. Even those politicians who are in favor of increasing the presence of armed security admit that it is unrealistic to expect it to provide enough coverage, so they want to supplement that by arming and training teachers. I am hard-pressed to even want to discuss that, but since it has been put forward as a viable solution, it’s necessary to talk about. I will say that even though there are a number of obvious logistical problems with this idea that I will discuss, there are moral and ethical ones that deal with the whole concept of education that I find most troubling. Cost: Let’s forget that schools lack funds for decent technology, books, printer toner, and teachers are buying their own glue sticks. Let’s imagine that there are new funding sources available when guns become the priority. There are over 3 million teachers in America and about 100,000 public schools. So we’ll get each teacher a Ruger LCP (a small, popular, and inexpensive gun) and 1 box of ammunition. That’s about $780 million dollars. We could arm only a fifth or about 718,000 as was suggested. That’s like doubling the Army and Navy. You probably would need other guns though which would drive up that cost. There would probably have to be a bid system. This doesn’t include the cost of training which is about $300 per person per day. Then you have the cost of security devices for those guns. On top of that there is all the licensing, but maybe that will get waived. Would teachers with this extra training get these bonuses that were talked about? How much more would that add to the overall cost? I guess we could make the teachers pay for it. I mean we already expect them to pay with their lives to protect those kids. And if not we could just increase everyone’s taxes, right? Training: America’s teachers lack quality professional development in a number of key areas. That was part of my motivation for this whole blog. But we’ve decided that their days already packed with grading and students over-tested to the point that there is precious little time for basic instruction will now be taken for that training. And then those same teachers, that some schools don’t trust to use the office copier, will be entrusted with guns. Where does the time for training come from? Do we take it away from instruction? Do teachers lose their preps? Or will we be paying more for the overtime? There are programs that offer free training for teachers that is funded through donations, but it runs $1000. Insurance: I mentioned the cost, but at some point, even insurance companies might see this as a losing actuarial table especially if a student is shot who was unarmed. Achievement: Our schools are falling behind other nations, but our focus now needs to turn towards the arming and firearm training of people whose job is supposed to be education. What does it matter though if we don’t have the training necessary for the jobs of tomorrow? I mean, how could a lack of education and poor job prospects lead to increased depression and possibly gun violence? School guns must be the only real solution to this ongoing violence, he said sarcastically. Accidents Increased Risk: Here’s a sampling of stories: an officer shoots himself responding to a school, a video of an officer shooting himself in a school safety training, a teacher left a gun by the toilet, and teacher shoots self in the bathroom. Maybe it’s not the guns and the bathrooms are just dangerous. I think most of the teachers I meet are great, but they can be disorganized, lose their keys, misplace their cellphone, or just be exhausted. If guns are more prevalent in schools we have to take that whole 18 school shooting figure into account since accidents may be a greater possibility. How much more likely is that it would be used wrongly by a suicidal or disgruntled employee? Or that it accidentally shot someone or fell into the hands of a student? Or imagine an active shooter situation where several teachers are firing. What is the likelihood that they would only injure the shooter and no one else? Fewer Teachers: It’s likely though that many teachers won’t want to work in this kind of environment, so we’ll lose a lot of teachers. Then we’ll have to pay even more to draw new teachers or just let the class-size grow drastically larger than they already are for even less effective teaching. But then again, maybe there will now be a new influx of people who are eager to be newly armed teachers. I’m sure they’ll be great with the kindergarteners. But then, maybe a lot of kids will get pulled too by apprehensive parents. So we’ll just have fewer students educated all around. I’m sure that can’t hurt us in the long term. Police Safety: Officers are already overwhelmed with too many responsibilities and most of them will tell you that their job would be easier with fewer and less powerful guns in the hands of civilians. That’s why police find it unwise to arm more teachers since they would be hard pressed to be sure who intended good or not at the moment it’s required. Fear: In Parkland, the armed security officer didn’t confront the shooter likely out of fear. It’s a reasonable fear given the nature of an AR15 and how unlikely it was that his efforts could have singlehandedly stopped the shooter. We are asking teachers though to span that gap. There are examples where an armed principal stopped a shooter, but even he is against arming teachers. Remember the physical damage caused by an AR15 is not like a 9mm handgun where the damage is often reparable. So even if there are enough Rambo teachers with accurate aim and stealth to confront the onslaught, what’s to stop them from being killed? And why should that be their responsibility? Likelihood of Stopping A Shooter: According to studies, even highly trained officers miss their intended target regularly and even more in high-stress scenarios like these. And again that AR 15 damage and speed makes accuracy unnecessary. Anyone not in tactical gear wouldn’t likely be able to approach even if they were a skilled marksman. Teacher Decision-Making: The other fear a teacher has to have is in making a mistake. What happens when a teacher must decide to shoot a student they see as a risk? Are they given the same leeway we’ve given officers in this regard to unarmed people? Is the feeling of a threat enough? Then what happens in the aftermath with the other students? Will the bonus pay for counseling? Racial Disparities: Let’s make a ridiculous assumption that no teachers are cruel, disturbed, or racist. What happens once students, especially minority students, learn that the teacher is carrying a gun? Will they begin to view teachers with inherent distrust? There goes more weakening of instruction. Remember that Philando Castile was a legally armed school employee who was killed in a non-active shooter situation. So what’s the risk for teachers (especially those of color) who are now regularly carrying those now-required firearms to and from work? Are they now part of the police force or are they still separate? Do they get uniforms to set them apart? How does that impact the students? School Atmosphere: Welcome to prison boys and girls, now who’s ready to learn? This is the most morally objectionable reason for guns in schools. Schools are intended to be welcoming places of learning. Setting them up as a fortress or prison only hinders that. Putting both kids and teachers up in an environment where they expect violence only perpetuates it. It’s like the Stanford prison experiment or anytime you go through airport security. After that, would you feel like sitting through 6 hours of rigorous study? Making our schools more like prisons and our teachers more like guards only sees to exacerbate the school-to-prison pipeline. Conclusion: Oh and ultimately, it’s not our @#$%*(! job. Will I take a bullet for my students? Does anyone know that for sure? I know I’ll do everything I can to try to keep them from harm? That’s part of why I write this. Should my sons have no more father because I chose to educate your children also? It’s a big ask. It’s almost enough to make us question why an organization that receives most of its funds from gun manufacturers thinks more guns is always the answer. Almost. So I saved this for last, and, if you’re still reading you must really want to know my thoughts here. America is unique in it’s connection to guns. It’s integrally tied to our history and persona as cowboys. 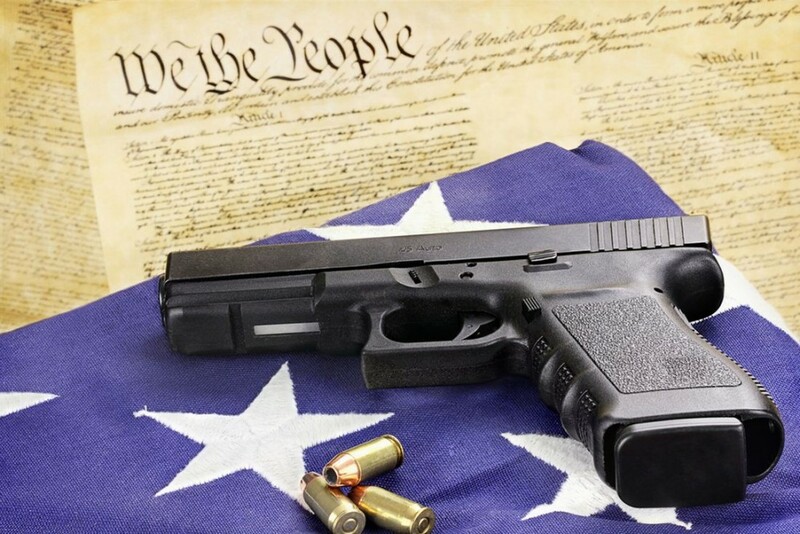 We have them enshrined in our constitution, and the history of the 2nd Amendment and organizations like the NRA are more complex than you may realize. But there are few cowboys left and the Wild West is gone (except in West World). So let’s look at a few facts and arguments. I get it that guns are not yet controlled by drones and that human arms and minds are attached to them. There is a question of scale though. The worst school stabbing incident in recent memory injured 22 people and no one died. Even with guns, the trauma caused by a semi-automatic weapon like an AR15 is very different from other guns. It’s a question of scale and how many people can be hurt and killed quickly and easily. In fact, unarmed civilians have been more effective at stopping assailants than armed ones not to mention decreasing the risk of extraneous injury to themselves or others. Yes, I know. That’s one of the 3 issues around guns that I said needed to be addressed. It doesn’t prevent us from also addressing the others though. If you are a licensed and responsible gun owner with appropriate training and security in place then it’s possibly true. On average though, you’re more likely to be hurt or killed likely in an argument with someone else with a gun. Oh yeah, and gun-owners tend to be prone towards impulse and aggressive behavior. As for women, you are 5 times more likely to be killed by your partner with a gun than by a stranger. Except that they would. As I said above there a multiple gun-related issues and no blanket solution for them all, but an age limit or restriction on a semi-sutomatic weapon that were in place for handguns would have stopped the Parkland incident. The goal though isn’t stopping one previous incident but many future ones. Okay, we should, but society changes and the laws should change with them. We find error or new technology that makes old laws obsolete and we create a new one. Also the laws we currently have are piecemeal at best since there are few federal inititives. That means it’s done on a state by state basis and guns easily cross state lines. Over 75% of the guns used in mass shootings were acquired legally, so it would appear the current laws aren’t sufficient. This kind of logic seems to advocate anarchy. Is that what is intended? Thinking that laws inherently prevent crimes is misunderstanding the purpose and intent of laws. If the fact that laws are broken meant we shouldn’t have them, then every current or future law is meaningless. Laws though are meant to be both punitive and prohibitive. For example, increased penalties for drunk driving don’t stop it from happening, but it has decreased incidents and fatalities despite the perpetrators ‘not being of sound mind’. Having a driving age of 16 and test required to do so hasn’t stopped all underage driving, but the cost/penalty to parent and child discourages some and punishes those who break the law. Along those same lines, there are speed limits, mandatory safety features, restrictions on certain car modifications, etc. And that’s just for a car, an inanimate object that has an inherent risk that does serve a useful purpose for those that use it appropriately under the proper conditions. Yes, cities with more people have more deaths, go figure. If you want look per capita though states in the south along with Montana and Alaska (all with few gun regulations) have the most gun deaths. Also like I said guns cross borders easily and the guns used in many cities like Chicago an New York were bought out of state. If you examine mass shootings over the years, most are in places where guns are permitted and several times (like in Parkland) had armed security. A target is usually a place with which the shooter has a personal connection. So unless you plan on removing personal connections (which can actually prevent shootings) this argument holds no water. Or at least not until robots are driving us everywhere. Again, I haven’t heard ban all guns from anyone. The fallacy of the car argument is that as cars became more prevalent and more efficient at getting somewhere quickly (thus deadlier) laws were passed to compensate (seat belts, licenses, mandatory insurance, etc.). Why can’t we follow that model for guns? Why are you so obsessed with cars and why do you keep bringing them into this discussion? Yes, there are more guns in America than cars (which sounds kind of ridiculous) and they are fewer fatalities and injuries. That’s part of why we regulate them heavily along with other things that cause fewer deaths than guns,. If you consider the 3.2 trillion miles driven though, cars are statistically safer. There may be a good point in this as banning one gun may lead to improvements in other guns which will require updates to any laws. That said, why not make murderers get creative and have to be ingenious? Why do we make it easier for them? The 1994 assault weapons ban though was effective at decreasing mass shootings. When it expired in 2004 that rate went back up. Again I urge you to read about the history of gun law. We seem to agree that it doesn’t refer to dynamite, bazookas, or tanks (I think), so it’s not unlimited. It was written by pre-electricity slaveholders, but it doesn’t mean it doesn’t have merit. The idea of a ‘well-regulated militia’ was in an era where Washington despised the idea of a standing military (like the massive one we have). Also, the idea of individual ownership right was not recognized until the (5-4) opinion on DC vs. Heller in 2008. According to who? There are 3oo million+ of them. I don’t see them disappearing anytime soon even if there’s an assault weapon buyback. Also when this part of the argument devolves in Godwin’s Law level Nazi comparisons about gun removal then I know it is ridiculous. As noble as this may sound, I think most of the people making this argument are just making excuses. If you want to work in the service of fighting tyranny, serve in the military. If you think your stockpile of 5-10 guns is what prevents a government armed with drones, tanks, and nuclear weapons from turning to tyranny than I would like you to reread the Constitution in its entirety to realize it isn’t predicated on one amendment. Gun ownership, though in fewer American homes, is still part of American identity and is a profitable American industry and pastime. Having used firearms, I get that they’re powerful and even fun when you’re hitting that target. But if baseball and apple pie were killing dozens of kids on a regular basis we would get some better helmets and switch to peach cobbler. Look at the history of our gun laws and timeline of mass shootings and you will see that there is a correlation between the two. What can we do about a problem that costs us $229 billion per year? Organizations like Sandy Hook Promise teach us to recognize the signs to prevent these tragedies. On top of that security measures can’t work alone. Other suggestions include making schools like churches in some ways. Sometimes we have to address the gun. Ralphy’s mom knew better that he’d shoot his eye out. We need to stop doing that to ourselves. It’s hard to say which measures will have the most impact for each problem as I said the CDC is prevented from studying guns and the ATF is prevented from computer records. We could start with those 2 things. Then closing background check, ID loopholes could/should be next. We could also put back in the mental illness provision that the current congress/administration repealed. Perhaps we require mandatory training for a license and insurance (like cars). Then it comes to examining specifics about guns (bump stocks, limited magazines, required childproof trigger locks, required Identilock, etc.). Some of those could prevent a lot of accidental shootings or unauthorized use. Some of that may not have changed this 1one instance, but it could address several related gun death issues. Perhaps reauthorizing the assault weapons ban that expired in 2004 may have an effect. It should be noted that there are 6 states where an ID would be required for a handgun (in private/gun show sales) but not for an AR 15. That seems, at the very least, like an oversight that should be rectified. Maybe as a society, we’ll decide at some point that for the sake of safety we should ban all guns or for the sake of freedom, even former felons should get a bazooka. But for now, there’s a whole spectrum of things that can/should be done between those two poles. This idea that’s it’s all or nothing thing seems to prevent anything from happening. I’m out of breath with this though from listening to people argue about numbers in an effort to ignore facing the real issue. I’m appalled hearing them blame video games and kids today. I’m sick of people conflating background checks with Nazis banning guns. I’m weary of people pointing that 1 restriction or effort wouldn’t have helped in 1 specific instance and ignoring instances where they would, to justify doing nothing. I’m mad at those who try to bring in other issues just to distract and who try to argue that laws won’t help because, you know, criminals. Maybe a return to the Wild West is what they really desire. I’m furious at those who blame the victims for not charging him with their own gun blazing and suggesting we need more guns around to fix this. I’m sad for those who buy into that propaganda pushed by the very people who profit from those gun sales. I’m sick of hearing about how ‘cities with gun laws’ have shootings (ignoring contrary statistics) as though we are a nation of walled cities. I’m done with the argument about ‘government tyranny’ as though somehow your 4 rifles are what are preventing the governmental overreach. I’m frustrated with those who try to use the complexities of mental health as a shield and scapegoat while refusing to do anything about it and actually taking steps that impede health care. So I’m done arguing and I’m done trying to nicely placate those who refuse to recognize our uniquely American problem. I’m finished just commenting after seeing innocent kids die because more needs to be done than refuting baseless online arguments.